Flevy Blog is an online business magazine covering Business Strategies, Business Theories, & Business Stories. What Is Value Based Management (VBM)? How Should the Traditional Car Makers Respond to the New Competition? What is Business Strategy without proper Execution? 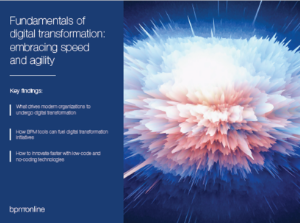 Can you accelerate your Digital Transformation efforts? Want to save hours on your future presentations? 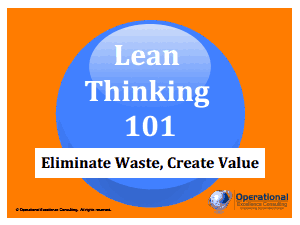 Do you work in Operational Excellence or Lean Six Sigma? Key Account Management: How to Manage Large Global Accounts? What's the Best Way to Manage and Communicate with Virtual Teams? Can Business Communication Be Thought of As a Science? The Flevy Business Blog (http://flevy.com/blog) is a leading source of information on business strategies, business theories, and business stories. Most articles have been contributed for management consultants and industry executives with over 20 years of experience. If you would like to contribute an article, please email our editor David Tang at [email protected]. Flevy (http://flevy.com) is the marketplace for premium business documents, such as management frameworks, presentation templates, and financial models. Our documents are of the same caliber produced by top tier consulting firms, like McKinsey, Bain, Accenture, BCG, and Deloitte. Learn more about Flevy here. © 2019. Flevy LLC. All Rights Reserved. Do You Have Any Difficulty with Strategy Execution? Get our FREE Strategy Primer. Strategy without execution is merely theory. 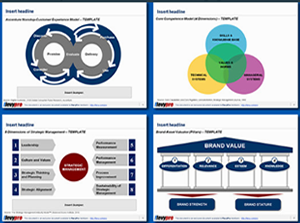 Many companies develop robust strategies, but struggle with operationalizing their strategies into implementable steps. 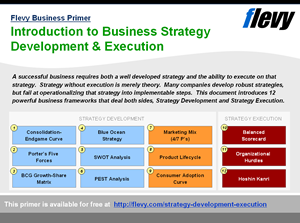 This 54-slide presentation introduces 12 powerful business frameworks spanning both Strategy Development and Strategy Execution. No thanks, this isn't something I need right now.